Eberron was born sixteen years ago. It’s been eight years since I’ve been able to write new material, and in that time I’ve worked on many things… Illimat. Action Cats. Even another roleplaying game, Phoenix: Dawn Command. But in all that time, my heart’s still been in Eberron. And now Eberron has come to fifth edition. 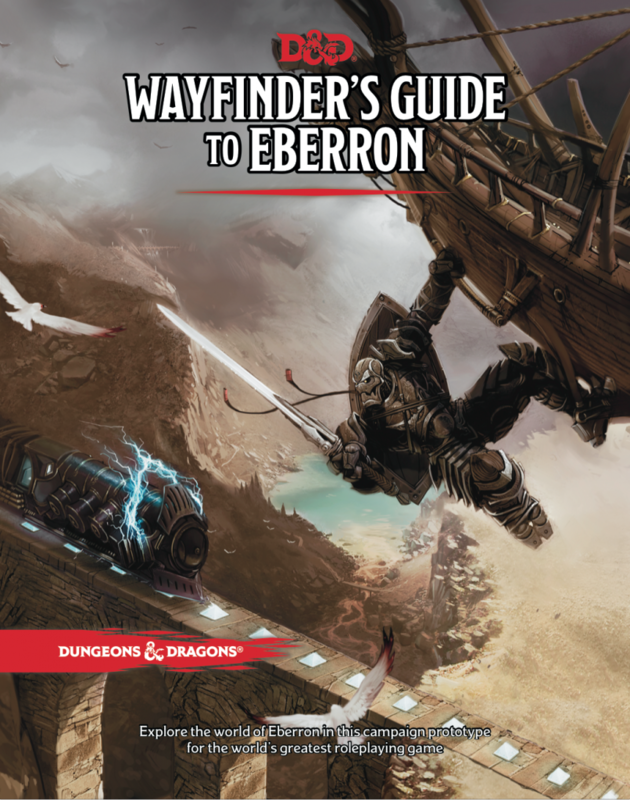 The Wayfinder’s Guide to Eberron is now available on the DM’s Guild. It’s a PDF product, and it’s treated as Unearthed Arcana material. This is Eberron as I’m playing it at my table. The goal is of the book is to give you everything you need to start running Eberron at your table… but also to test these ideas and get your feedback on them. It’s a 170 page book, and the bulk of it is about the world. But it’s also a living document, and the mechanical material—races, dragonmarks—will evolve over time. This is one reason it’s not currently available as print on demand; the PDF will be updated as we gather feedback on the material. So what is the Wayfinder’s Guide to Eberron? I’ll start by telling you what it’s not, and that’s a rehash of either the Eberron Campaign Setting or the Eberron Campaign Guide. Both of those books are available on the DM’s Guild, and it seemed foolish to lead off with a book that simply repackages information many of you already have. The WGtE isn’t an encyclopedia. It doesn’t delve deeply into history or geography. Instead it talks about the themes of Eberron, the things that define the setting, and how these can affect your game. How can you capture the feel of pulp adventure or neo-noir intrigue? What impact could the Last War have on your character or your campaign? The Wayfinder’s Guide includes the following things. 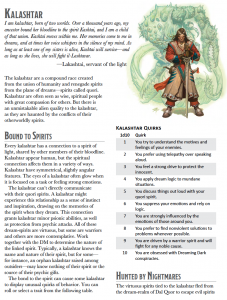 New versions of changelings, kalashtar, shifters, and warforged, along with information and ideas about how the common races fit into Eberron. If you’re a Mror dwarf, why did you leave the Holds? if you’re a Zil gnome, what schemes are you caught up in? An overview of Khorvaire with a focus on ideas for characters and NPCs from each nation. Rules for dragonmarks, the mystical sigils that play an important role in the setting. This includes greater dragonmarks and aberrant dragonmarks. A selection of unique magic items, including dragonshards, warforged component items, and new arcane focuses for your wandslinger. An overview of Sharn, City of Towers with a focus on getting you started with your character or your story. This includes a host of interesting background hooks and story ideas, along with three separate starting points for different styles of campaign… including the gritty Callestan campaign I’m running at home! The Wayfinder’s Guide is written for both players and DMs. It doesn’t give away any of the deep secrets of the world, but it’s designed to serve as an inspiration both for creating characters and adventures… and I’ll just say that there’s a lot of ideas squeezed into those 170 pages. Eberron has been unlocked for the DM’s Guild. I’m currently working on the Morgrave’s Miscellany with guild adept & Inkwell Society creator Ruty Rutenberg (who collaborated on the dragonmarks and races for the WG). 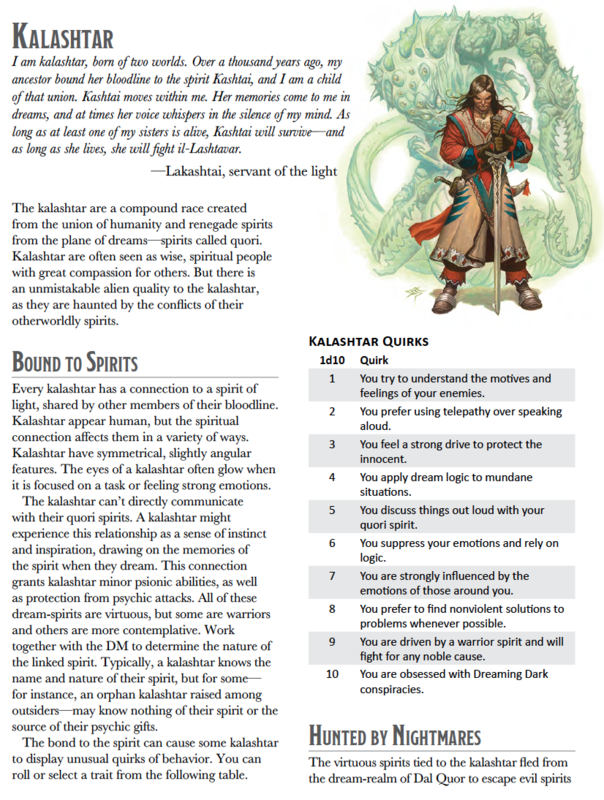 The Miscellany will delve into a range of subjects that didn’t make it into the Wayfinder’s Guide, including Siberys Dragonmarks and some classic Eberron archetypes. Beyond that, there’s a host of topics I’ve been wanting to explore for years now: the Planes of Eberron, Droaam, Darguun, Eberron Underwater, and more. I’ll get to all of these things and more; it’s a question of when. I’ve posted a poll here, on my Patreon site; you don’t have to be a patron to vote on it. Let me know what you want to see first! In addition to writing new material for Eberron, I want to get back to another project that’s been on a back burner for a long time. Back in 2009—before the age of Kickstarter and Patreon—I bootstrapped something I called Have Dice Will Travel. I roamed around the world running an Eberron game for interesting groups of people. I wrote about a few of my adventures for The Escapist, but lack of funding and a creative collaborators caused it to fizzle out. Now with crowdfunding, new support for Eberron, and my partnership with Jenn Ellis and our company Twogether Studios, we’re exploring different ways to bring back Have Dice Will Travel. We don’t yet know exactly what form this will take. A travel/D&D podcast? A book? Both? What we do know is that we want to capture the diverse people around the world who play RPGs and tell their stories. If you want to make sure you get the latest news, join the Twogether Studios mailing list. And if you feel that you have a particularly interesting gaming group or town we might want to visit on our tour, follow this link and tell us about it! That’s all for now. Thank you for joining me in this return to Eberron. I look forward to seeing what all of you do with the world!